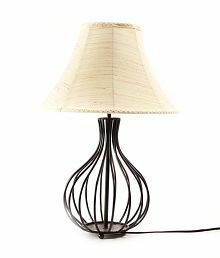 RDC Black Double Ring Stand Table Lamp with 10" Round Slanting Cream-khadi with Brown Lace Border Lamp Shade@445 Rs [Mrp:-445] - Onlinedeals.discount - A leading product discovery website. Find the true prices of products, read reviews and buy top brand products at reasonable prices. 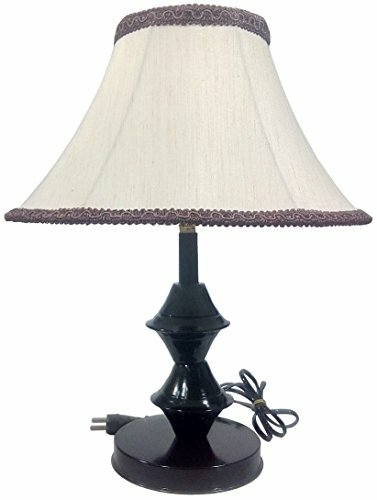 This is a metal Table Lamp with black stand and comes with 10 Inches Round Slanting Cream-khadi with Brown Lace Border Lamp Shade. The lamp shade gives a fair contrast to the body and it goes well with almost all home decors. To view all our products together, visit: www.amazon.in/shops/A6EQA74PP5X2S or click on RDC link above.